The pastry case at Arsicault Bakery. Photo from Facebook. At Ichi Kakiya, facing the front. Photo by Darren Samuelson. Nucha empanadas. Photo: © tablehopper.com. 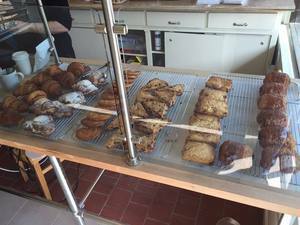 The Inner Richmond has a new bakery, called ~ARSICAULT BAKERY~. It’s owned by baker Armando Lacayo, and the specialty is authentic, French-style croissants and other pastries. They have several kinds of croissants, including plain, almond, and ham and cheese, along with scones, palmiers, and kouign amann. They officially opened last week and apparently sold out of goodies over the weekend! They are also serving Equator coffee, and have an espresso machine coming soon. In the coming months, also look for some additional “cold” pastries, like seasonal fruit tarts. Hours are Mon, Wed-Sat 7am-3pm, Sun 8am-3pm, closed Tue. 397 Arguello Blvd. at Clement, 415-750-9460. We released all the first look details about ~ICHI KAKIYA~ last week, the new oyster shop from the ICHI crew, and we wanted to let you know they are opening tonight! You can check out the menu here. Hours are the same as Ichi Sushi: Mon-Thu 5:30pm-10pm, Fri-Sat 5:30pm-11pm. 3369 Mission St. at Godeus, 415-814-3877. After walking by this location numerous times every week (it’s in my neighborhood), the plywood has come down. 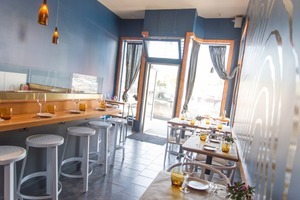 The Western Addition/Nopa has a new Chinese restaurant: ~KUNG FOOD~. Owner Andy Yan tells me his family used to own Rice and Roll in Pacifica (they like puns, this family), and the chef is their uncle, who has been cooking all over the U.S. for the past 15 years. The menu is primarily Hunan and Mandarin, plus some usual suspects like walnut prawns, Mongolian beef, and let’s not forget crab Rangoon. There are also a few dim sum choices (shu mai, steamed barbecue pork buns) and some Korean-style wings too. Yan mentions the top dishes are their basil eggplant with chicken, chicken lettuce cups, and for vegetarians, their basil meatless chicken (and they will cook vegetarian dishes in separate woks or fryers on request). They have 20 seats and free delivery. Hours are Tue-Sun 11am-3pm and 5pm-9:30pm, closed Mon. 1615 McAllister St. at Divisadero, 415-673-6688. Last month we mentioned ~SQUARE MEALS~ was opening a takeout space in the former ~LILAH BELLE’S~ on Divisadero, which is currently open Mon-Fri 11am-8pm. In addition to the salads, main dishes, soups, and more, one more vendor is on the shelves: Nucha Empanadas. 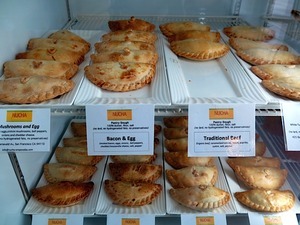 The Argentine-style handmade empanadas come in all kinds of flavors, from classic beef to mushroom and cheese to some breakfast versions, like bacon and egg. You can get three for $9, and you just warm ‘em up at home. Yup, it’s the original hot pocket. (Pro tip: pay attention to which flavor is which and write it on your bag—otherwise when you get home, they will all look the same.) There are also some quiches, Argentine sauces, and alfajores. 1207 Divisadero St. at Eddy, 415-674-1069.